"Round here, it's your own and no-one else's"
In his search for Fenton's house and precious notes, Charles comes across the figures of Sanders and Jim, working at a roof repair. Cautious and suspicious, they agree to help — but only because Richard Fenton is a friend and neighbour. Charles is gambling that, through Sanders and Jim, he may yet be able to find Fenton's home and retrieve his 'record of half a nation'. 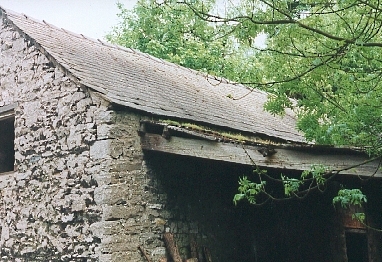 Description: The lean-to barn roof on which Sanders and Jim are working is in the grounds of the Upperdale House Bed & Breakfast hotel in the heart of Monsal Dale. Where is it? : The hotel is situated at the junction of the only crossroads in the centre of the valley. Where's the best vantage point? : While the area can be viewed from the public roadway above, and — at a distance — from the roadway to the side, Upperdale Farm itself is private property, and fans should not trespass on the site. The shot it taken looking up from ground level towards the roof of the barn. Anything else? : Fenton's house; the bridge under which Charles evades his hunters; the house from which Charles takes the bike; the lane along which he suffers his puncture and the barn in which Charles tends his wound are all very close by. Upperdale House offers both B&B and self-catering accommodation. For details, see here. The main roadway through the Monsal valley passes above and behind the barn.